If you’re looking for [tag]girls basketball drills[/tag] for your next [tag]basketball practice[/tag], try this Three Girl Weave drill. 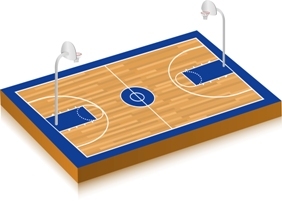 The object of this [tag]basketball drill[/tag] is to create a 2 on 1 fast break situation. Girls perform a typical three girl weave from under one hoop to the other. We concentrate on keeping the weave tight, making good passes, not traveling and making the final pass a bounce pass for a layup. The shooter then sprints back to the opposite free throw line and becomes a defender. One girl grabs the rebound and begins a “fast break” towards the opposite hoop. The last girl has chosen a side of the court & is heading up court towards the hoop. Focus on the dribbler keeping her head up, dribbling with good form and making a good pass to the other offensive player. The defender must first defend the [tag]basketball[/tag] and rotate back to defend the pass and box out.